Waiting for results from a medical test or procedure can be a very taxing and worrying time. In our experience, you usually go through a whole rollercoaster of emotions. Then the letter from the hospital arrives. You quickly rip open the envelope and start reading. However, these letters are not actually written for you, but for your local GP. This means they are usually full of medical terminology and scientific speak. They obviously make sense to the intended audience, your GP, but not to the person (you), who has been copied into the letter out of courtesy. Reading this letter can either cause a sense of confusion, terror or bewilderment. What does “delayed” mean? …What does that figure mean? …Is that good or bad? …What I am supposed to do next? …Should I contact them, or do they contact me? These hospital letters, although supposed to be useful, can lead to a whole barrage of questions and cause you to feel uncertain. So, why are we writing about this? Recently, a colleague showed us a confusing letter that she had been sent from the hospital. Unsure of what the letter meant, she asked us if we could help decipher the jargon. 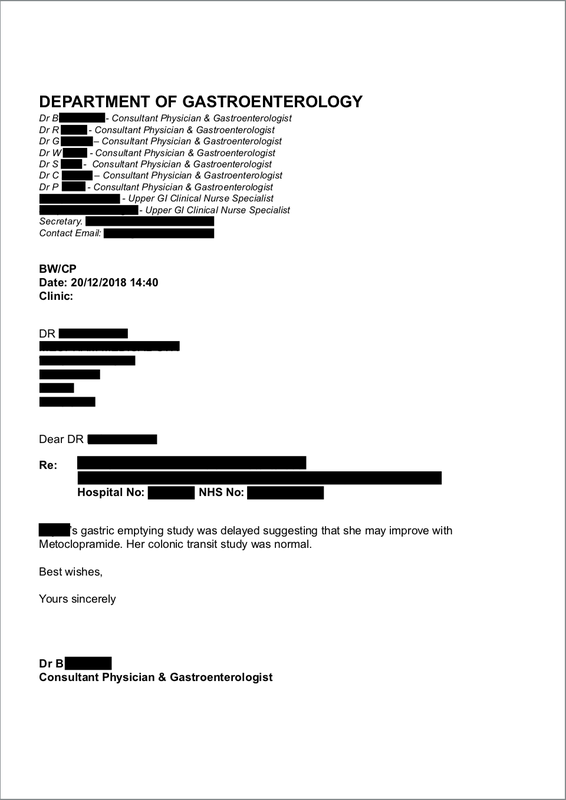 After deciphering what the results meant for her and what she was supposed to do next, we thought about how other patients must feel when confronted with this type of letter. 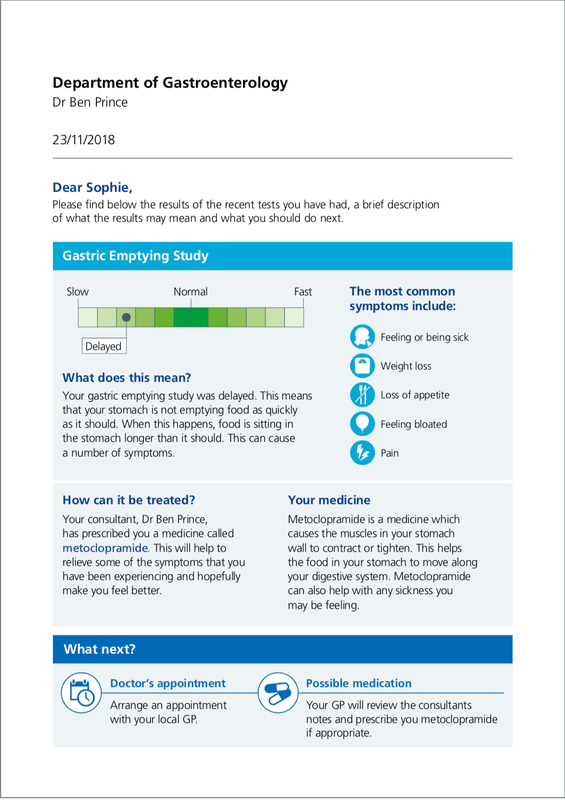 As an agency that believes whole heartedly in the principles of health literacy and the need to listen to the patient’s voice, we decided to see how we could transform this letter into something more understandable for those who do not have a medical background. So given the brief, “if a patient was given these results directly, how could we make it into something they could understand and, most importantly, act on?”, our studio, working with medical writers, transformed the hospital letter. You can see what we came up with below. One of the first things we noticed was the lack of explanation. Obviously, the GP reading this letter would not need this, but as a patient, putting the results into some form of context is very important. It ensures the patient understands what the results actually mean for their health. The tone of the letter was very matter of fact and not very patient friendly. The actual results of the tests were very unclear and it was not very obvious what our colleague was supposed to do next. More than half of the page was used to list off all the consultants working at the practice, an address and codes that a patient would not understand. As healthcare designers we know that patients rely on us to guide them through documents and draw their attention to the information they need the most. 90% of information that comes to the brain is visual so patients may struggle to understand something as text heavy as this letter. By explaining the results in plain English and avoiding the use of jargon, you can help take away some of the uncertainty and ensure the patient understands what they are reading. By using simple visualisation to show the results, even if the patient is unable to take in the text, they should be able to understand what the graphics mean. Visualisation also helps put the results into context. By breaking down the results into more manageable chunks, the patient does not have to take too much information in all at once. It is also easier to highlight the important things the patient needs to know and understand. This was something that was not evident from our colleague’s original letter. So, we made sure ‘in our transformation’ that there was a clear call to action, which signposted exactly what the patient was supposed to do next. Colour can increase a reader’s attention span and recall by 82% and is a great way of drawing attention to the most important information for the patient. Colour was used really carefully through the letter. We deliberately avoided any colours associated with warning or caution in the scale so that the patient’s first response would not be panic. We used simple imagery to help with low literacy levels and to make the letter more engaging. They were used to visualise side effects and break the next steps down into a clear visual flow. This kind of visualisation is not just about making something look cleaner, it is also about creating something practical that a patient could use. In this case, we added a notes section under the phone numbers so that when a patient called their local GP, they could make notes on the letter and keep all of their information, questions and thoughts together. The process of changing this doctor’s letter got us thinking about how many materials are out there for patients that are just as hard to understand. Other confusing medical documents, such as an informed consent form for a clinical trial, a dosing schedule or instructions on how to use a medical device, are just a few of them. This is why we have decided to start this ‘Health literacy in practice’ series. We are going to be taking these materials and showing you how they can be turned into something more suitable for patients and their level of health literacy. Watch this space to see what we tackle next.